Using the latest dealer specified software and using genuine spec parts, we can service even the newest vans and cars and keep them under manufacturers warranty, so no need for those hefty main dealer charges making us your number one choice in Derby for car servicing. Aarons Autos is on average 60% cheaper than main dealers, offering quality professional service, plus the convenience of having your van picked up and delivered to your door. We also offer fleet servicing to companies who have several vehicles which includes monthly invoicing for less hassle. 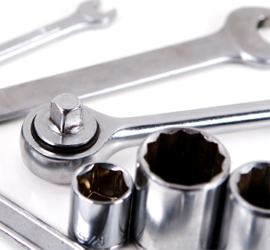 We carry out all types of repairs from changing a bulb to major engine repairs. We cover every area of the car such as suspension, steering, brakes, exhaust and much more using only genuine spec parts on all repairs. We are approved to carry out insurance, warranty and breakdown repairs from companies such as R.A.C. the AA and More Than. All vans and cars older than three years require an MOT by law so why not book your vehicle in early to prevent any inconvenience. Once you have had an MOT at Aarons Autos you will get a reminder the following year a month before it is due.